GigajamVLE is an online music school comprising of the awarding winning Essential Skills Courses for guitar, bass, keyboard drums and theory. You can also follow the Gigajam programme of study towards earning a Bronze Arts Award. Gigajam’s unlimited user licence is now just £1 per pupil, per year, based on the number of students within the Key Stage(s) you wish to have access. 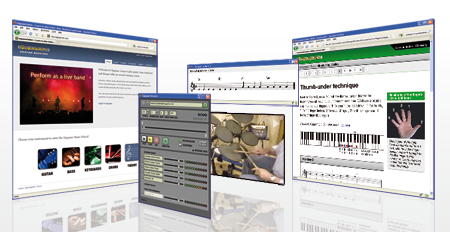 Every eligible pupil can learn to play the guitar, bass, keyboard and drums, as well as practice at home with our online lesson content and software. The minimum order value is £150 + VAT at the standard rate. Gigajam will provide a minimum of 50% discount on all aggregated purchases for BSF, Academy Groups, LAs and RBCs. The exact amount of discount available is negotiable and based on the number of participating educational establishments and the length of the licence. Please contact us to order or for advice and preferential terms.